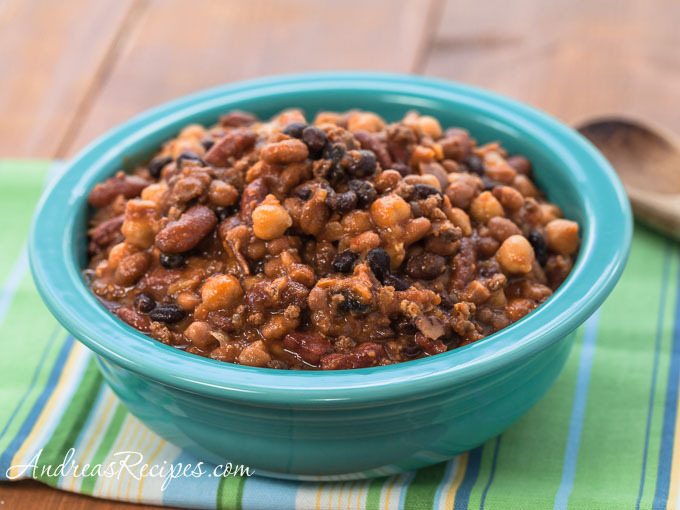 When I was growing up, baked beans were a delicious part of all our cook outs and potlucks. Cans of pork and beans were mixed with ketchup, brown sugar, Worcestershire sauce, and onions, then baked in the oven. Sometimes strips of bacon were laid on top, creating a smoky aroma and flavor that reminds me of many summers spent playing outdoors all day long and outdoor meals enjoyed with family and friends. I haven’t made baked beans in a long time and this summer I was looking for an excuse to make some. Our neighbors hosted a potluck cookout over the weekend, and I jumped at the chance to try out a slow-cooker variation of my favorite baked beans recipe. This version is made with four kinds of beans, ground beef, and bacon and then slow-cooked for five or six hours. They smelled wonderful as they cooked, and they were a hit at the potluck. The flavor is a little sweet, a little smoky, and a little tangy; a nice combination. The recipe calls for 8 ounces of bacon, however the brand of bacon I prefer comes in 12 ounce packages, so I used it all because we don’t use bacon very often and keeping it on hand just doesn’t make sense. What’s a little extra bacon in a pot of beans? In the frying pan, brown the ground beef over medium-high heat, mincing as you go. Drain on a paper towel, then add to the slow cooker. Wipe out the frying pan with a paper towel and add the bacon. Cook over medium-high heat until the bacon fat is rendered. Remove the bacon, drain on a paper towel, then add to the slow cooker. Drain the bacon fat, reserving 2 tablespoons in the skillet. Saute the diced onions until soft. Drain the onions and add to the slow cooker. Put the remaining ingredients in the slow cooker and cook on low for 5 to 6 hours or on high for 2 to 3 hours. Oven method: Put the ingredients into a 4-quart glass baking pan and bake in a 350° F/175° C oven for about 45 minutes. Use dry beans instead of canned: Soak and precook 1/2 cup each navy beans, black beans, garbanzo beans, and kidney beans. Drain and add to the slow cooker. This is my kind of baked beans! I’m saving this recipe for my next family get together. Good greif…do I ever lust for a piece of the Inside-Out German Choloclate Cake. I’m on my way to the grocery now.